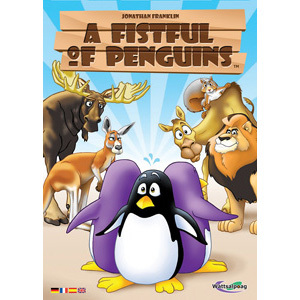 A Fistful of Penguins consists of lots of very cute, clear plastic penguins and some dice which have different animals on each face. On their turn, a player starts by rolling 4-6 dice (depending on which of the 3 rounds it is). After their roll, a player can either (a) stop rolling and cash in their roll, or (b) they can spend one of their penguin pieces to either re-roll any of their rolled dice, or they can roll 1 new dice and add it to their rolled result. Players start with 6 penguins so these options are open to them from the start of the game. Players can keep adding dice and/or re-rolling if they have the penguins to pay for it. When a player decides to stop rolling, the receive an income based on the various animals they have rolled: Penguins, Lions, Camels, Kangaroos, Squirrels and Moose (1 of each animal on each dice). Penguin results earn penguin pieces – you can even cash in dice with penguins on during your turn; however, the more penguins cashed in together, the more penguins the player receives. Squirrels mean other players have to give you money in turn order and more squirrels means more money. Moose are worth $9 each if they are paired with a squirrel (instead of the normal squirrel effect). Kangaroos are worth their total number squared in dollars. If you score kangaroos in the first and/or second round, you get to turn one or two of your dice into kangaroos in the third round. Lions are worth $7 each, but if you choose to score lions means only lions and penguins count (and all other animals are worthless).